Google chrome is the best browser in the world today. It has the simple interface, fast and more functionalities. You can use the whole collections of chrome extensions from the Google Web store. It offers plenty of useful extensions that will extend your browser further. Chrome Speak is a simple text to voice Chrome Extension that allows you to Select the text on a web page and then have that text read back to you in a digitized voice format. Chrome speak provides native support for speech on Windows (using SAPI 5), Mac OS X, and Chrome OS, using speech synthesis capabilities provided by the operating system. On all platforms, the user can install extensions that register themselves as alternative speech engines. Chrome Speak options have a text field where you can copy-paste or write your text and click the Speak button to hear it. It also has a stop button which you can use to stop the reading whenever you want. A separate panel with Voice Options is present where the voice can be set to native. Select text and select “Read the selection text” from context menu. Select “Stop reading” from context menu to stop current reading. Chrome speak provides support for speech on Windows, Mac OS X, and Chrome OS, using native Text-to-Speech capabilities provided by these operating system. Chrome Speak is a great, innovative extension that works as advertised. However, it needs some refinements to satisfy the users expectations. 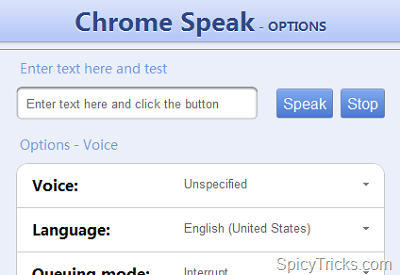 Download and install Chrome Speak here.